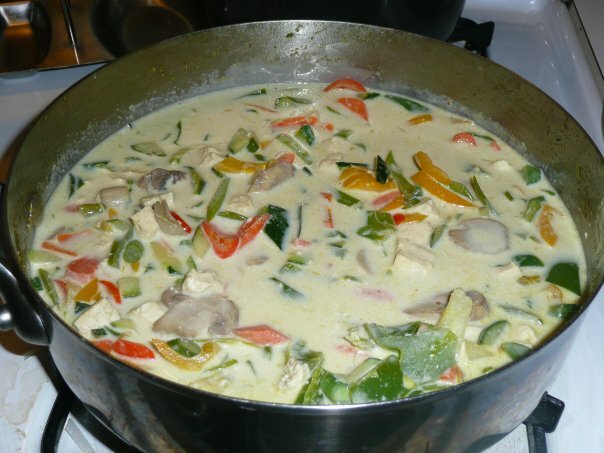 There are a lot of variations of basic Thai Curry and this is one of the variations that we enjoy. Being a vegetarian , I substitute tofu instead of meat. This is a quick version of the authentic Thai curry. If you want to decrease your preparation time, you may want to buy a bag Frozen Asian Stir Fry Vegetable Mix, available at Costco’s, Sam’s or any grocery store and stock a few cans coconut milk your pantry. Grow your own lemon grass if you enjoy gardening. This link shows you how to grow lemongrass. 1. Blend to paste- garlic, green chilies, ginger, cilantro, lemon grass, coriander pwdr, cumin pwdr, pepper, lime juice, soy sauce with ¼ th cup of coconut milk. 2. In a heated wok/ saucepan, add oil, chopped onions, tofu and the rest of the vegetables except tomatoes. 3. Add the remainder of the coconut milk and allow it to simmer for 5-7 mins. 4. Add tomatoes at the very end. 5. Adjust the curry taste as per your preference. If it’s salty,add a squeeze of lime juice. Add more chili if not spicy enough. If too spicy, add a little more coconut milk. If you’d prefer it sweeter, add a little more sugar. 6. Garnish with finely chopped basil leaves. 7. Enjoy it over rice noodles , steamed rice or quinoa.